It's not just housing that Richard Baron '64 considers when developing safe, affordable properties in neglected urban neighborhoods, but the human needs as well. McCormack House in St. Louis (below) offers special resources for its senior residents, such as meals and personal care. He was an idealistic student teacher 35 years ago, reaching out to an impoverished Cleveland east-side neighborhood plagued by riots, teacher strikes, and vandalism. A once prosperous, middle class community that harbored the Cleveland Indians' League Park, the Hough neighborhood later fell victim to the typical hardships of mid-century urban flight. An Oberlin student with a history of community service, Detroit native Richard Baron penetrated the 1960s Hough neighborhood to volunteer in its newly formed freedom schools. The experience was powerful, and he returned to Hough two decades later with a building project that sparked a housing resurgence and new attempts at the area's restoration. As president of the St. Louis-based McCormack Baron & Associates, Inc., Baron '64 is recognized nationally for leading the development of affordable, innovative housing in abandoned urban neighborhoods. He founded the firm in 1973 with his late friend and colleague, Terry McCormack, and has since built more than 8,000 housing units in 22 cities at a cost of $670 million. His holistic approach to neighborhood development, linked with his push to involve residents in the design, development, and management of their living spaces, sets him apart from builders with similar agendas. His firm's mission, he says, is "community building." A successful McCormack Baron project requires grass-roots activism, vision, and development expertise--an outlook embraced by those in the two-mile Hough neighborhood. Cleveland Councilwoman Fannie M. Lewis remembers leading Baron on a midnight tour of the area when he recognized its potential as a vibrant city neighborhood. "It looked like Beirut," says Lewis. "I asked him if he could do his project here. He took one look at the site and assured me it could happen." By 1988 McCormack Baron had invested over $20 million to create a 347-apartment development called Lexington Village, which today houses a smorgasbord of people. Teachers, doctors, and computer technicians pay market rents, while other units, reserved for low-income families, attract many single parents. The Hough transformation continues with beyond-hoped-for private development: a subdivision of $300,000 to $500,000 homes adjacent to Lexington Village houses a new generation of young professionals. Baron says the mixed-income approach is critical, both economically and socially. Inner-city projects can't be supported by rent subsidies alone, and the market rate units support a crucial layer of private first-mortgage financing. Equally important is the social impact of economic integration. Neighborhoods suffering from high unemployment and struggling schools find that the cross-section of families provides role models for kids from homes where adults don't work. The mix also ensures that the private sector will bring in its services--retail, recreational, and health. Affordability aside, McCormack Baron developments are also recognized for their architectural detail and amenities. "We spend an enormous amount of time designing communities that are architecturally interesting," says Baron. Residences are attractively landscaped and embrace suburban comforts such as pools, community rooms, and playgrounds. Dwellings are built to last with efficient heating and cooling systems and sound insulation between adjoining units. "I don't think Richard would design anything he wouldn't live in himself," says Lewis. Among the company's showpieces is Westminster Place in St. Louis. In 1983, Baron tackled a Gaslight Square locale nicknamed "The Stroll" for its once thriving prostitution business. For years the vicinity's only traffic--pedestrian or vehicle--was engaged in illegal activity. 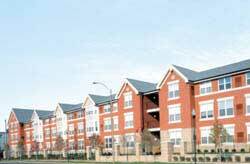 A creative combination of tax credits, bank financing, private equity, and ever-present vision helped create more than 400 brick townhomes and apartments with manicured front lawns, decorative facades, and wide sidewalks that invite children and families. A playground, community pool, and landscaped parks are within walking distance of a shopping center with a supermarket, video store, and service businesses. Beth Stohr, vice president of Mercantile Bank, a major financier of McCormack Baron projects. "He takes the one next step needed to build a successful community." In St. Louis, that describes two developments created especially for the city's oldest and youngest populations. McCormack House, a 96-unit assisted living complex for low-income, elderly residents, anchors the eastern end of Westminster Place. It resembles a retirement home for the well-to-do: a tall brick portico, natural gas fireplace in the lobby, contemporary artwork in the hallways, and comfortable, bright apartments. But McCormack House was built for people with few resources. "Just because you have reached the end of your life and don't have a great deal of money, doesn't mean you don't deserve a nice place to live," says Manager Jeanette Langton. Most residents rely on McCormack House's supportive services--assistance with personal care and medications, housekeeping, laundry, and meals in the wood-paneled dining room--at a nominal fee. Resident June Toth enjoys the camaraderie of the place and rattles off names of several friends she has met in her four months there. The only hard part, she says, is not being as independent as she once was. "That's okay," she laughs. "They're taking care of me here." East of McCormack House, the downtown St. Louis skyline comes into view through a metal-grey March sky. Here, in one of the city's poorest neighborhoods, are two McCormack Baron developments--1,200 low-rise, garden apartments and townhouses known as Murphy Park and O'Fallon Place. Jefferson Elementary is the local school, where even on a dreary day the atmosphere bristles with energy. A touch screen computer kiosk in the lobby showcases student artwork and displays real-time video of an arts performance in the gym and basic information about the day's schedule. In Ms. Williams' first-grade classroom, three groups of six children work in the Writer's Workshop, and four classroom computers help students "publish" their work. Upstairs, fifth graders use the Internet for research projects, and in a quiet first-floor room, several women, all parents of Jefferson students, learn computer skills using the latest in network technology and training.